West Valley, Ariz. – Benevilla is hosting another vital Caregiver Connect event coming on October 5th for anyone in a caregiving role looking for caregiver resources. Don’t miss this opportunity to connect with essential resource providers and interact one-on-one with health care and memory care professionals. Plus, you’ll have the chance to network with other caregivers in a supportive and friendly environment. Experts Brian Browne, President of Dementia Care Education, and Marty Finley, Sun Health Memory Care Navigator, are the featured speakers at this event. Browne will present “The Roadmap to Navigating Memory Loss,” followed by Finley’s presentation, “Home Safety and Alzheimer’s.” Before, between and following each presentation, you can visit an array of community and senior vendors for additional resources and information. The Benevilla Caregiver Connect is an annual series of 3 events which provide family caregivers with needed caregiver resources and expert education to aid them on their caregiving journey. 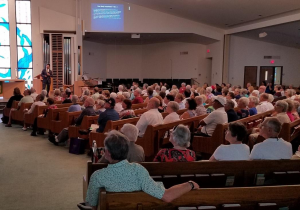 The August event drew some 200 attendees, and more than 100 are expected to attend the upcoming presentation. This third 2018 Benevilla Caregiver Connect event takes place at All Saints of the Desert Episcopal Church on Friday, October 5th, from 8:00AM to 1:00PM. The church is located at 9502 W Hutton Dr., Sun City, AZ, 85351. This event is free to the public. Registration is required. Call 623-584-4999 to register today while space is still available. Join us for 2 expert presentations, a complimentary breakfast from Birt’s Bistro, giveaways and an array of family caregiver resources. Started by the community and for the community in 1981, Benevilla is a not-for-profit human services agency dedicated to enhancing the lives of West Valley residents by providing care services for older adults, adults with cognitive disabilities, children, and families. Services are provided through a dedicated group of staff and volunteers. For more information on services, volunteer opportunities, to donate to Benevilla or to schedule a tour call 623-584-4999 or visit www.benevilla.org.